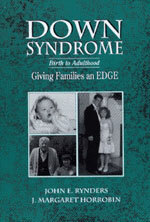 Filled with photographs of family activities, Down Syndrome: Birth to Adulthood is an invaluable guide for parents of children with Down syndrome, as well as the professionals who help advance their progress. The authors, well-known and respected leaders in the field, use case studies of families from the EDGE Project at the University of Minnesota to examine all the issues both large and smallin raising a child with Down Syndrome from infancy to adulthood. Research findings from several sources are woven into the pages in a clear, readable fashion, followed with numerous practical suggestions.